WM from 1997 to 2001. 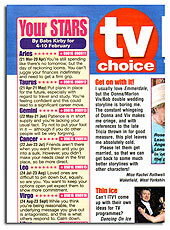 WM - The Women's Magazine , or the article as was published. The eclipse of August 11, 1999 hit the headlines because it was visible in the UK. 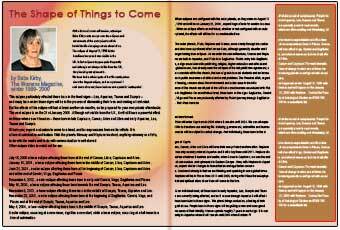 In fact eclipses happen quite frequently and although not always visible from the UK, they herald great upheavals. 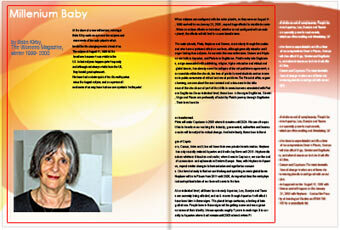 Babs Kirby compares the political fortunes of two Aries Titans by examining their birth charts. 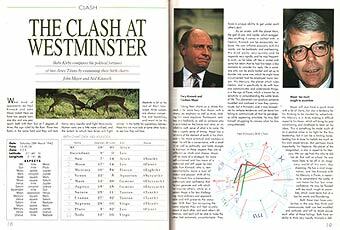 What kind of opponents do Neil Kinnock and John Major make? Here we have two people born one day and one year apart, both with their sun at 7 degrees of Aries, the sign ruled by the ram. This idealistic phase continues, during which you can’t be relied upon to make sensible choices. You’re romantic and gullible and believe the best of others. Tread carefully. 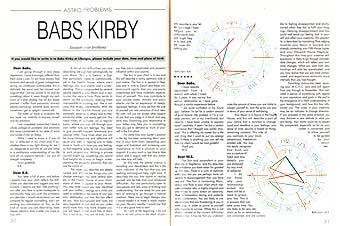 Babs Kirby answers problems based on readers horoscope and drawing on her background as a psychotherapist. I am going through a very deep depression. I have knowingly suffered from them since I was 15 but have always had tantrums and periods of great unhappiness during my childhood. Unfortunately this is definitely the worst and has caused such anguish that I am too scared to try and do something about it, even though my optimism of it ever ending has all but disappeared. There's a lot of excitement about the first babies born in the new age but what lies ahead for a child born in the opening moments of the year 2000. The clocks have just struck midnight . The air is thick with noise, people cheering, celebrating the dawn of the new millennium. Somewhere a baby adds its voice to the cacophony for the first time. Its just been born, a millennium child. This is what that very special baby will grow up to be..